This splendid arrangement comes with an intense mix of contrasting colourful flowers. 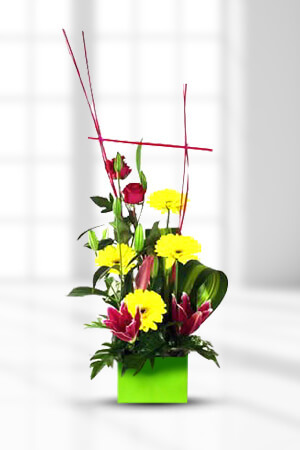 Orientals, Gerberas, premium Roses and tropical foliage, make this one a winner.Lilies may be sent closed/partially closed in order to prevent damage and to last longer.If you would like to make your gift that little bit more impressive, we recommend you send a box of chocolates with your chosen flowers. We recommend a superior box of chocolates to perfectly complement Illustrious. Great service and receipient extremely happy with her flowers. A large array of flowers to choose from which was fantastic. Prices were very competitive to other businesses. I just do not know yet if it has been delivered, being a death in the family the recipient may not ring. Fast service, delivered the next day to a rural area. Thank you. Folks who have received your flowers from us have always been very happy. Thanks for the excellent service! Thank you for the fantastic service! Easy to order, reliable and beautiful arrangements!